Have you ever considered driving to Belize? Last Thursday we packed up our new truck and trailer to make the 3000 mile drive to Belize. 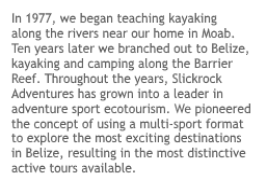 Every year since 1977 one of us has driven to Mexico (in the early years) or Belize (since 1986) with a whole bunch of water sport gear and other stuff we need down there. It takes about 8 days. My partner Cully used to do the drive, but after 20+ years he got pretty tired of it, so he taught Neri Chi to do it. Neri is our lead guide for our Belize Adventure Week trip. It’s a big deal, it’s not just about driving a long way. The primary thing is you have to learn how to deal with the border, and it’s different every time. You have to create a relationship with a border agent. This person helps you get all of your stuff across Mexico with as little duty as is allowable. You have to know how to pack everything, how to declare everything, and of course, what the best way to go is. Neri has gotten so good at it that he has even done it alone. However, this year for the first time ever his wife Herme did the drive with him. 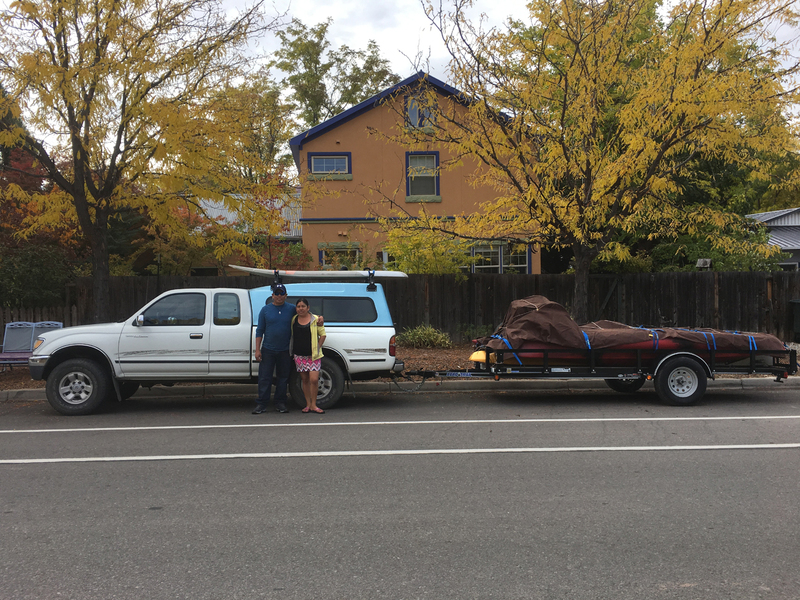 They flew up to Moab about 2 weeks ago to visit two of our long-time guests, Dave and Marilyn Stolfa. The Stolfas wined and dined them, taking them to Salt Lake City, Canyonlands, and Arches. It was Herme’s first trip to the United States, first plane flight in her entire life, first time to drive across Mexico…. what a trip for her! By now they are somewhere in the middle of Mexico, getting closer to the Belize border. Soon they’ll arrive and everything will get unloaded and sent out to the island! On our Belize Adventure Week 8-night package we include one full day at Mayflower Bocawina National Park in southern Belize. There we spend hours on the 7-step, longest zipline in Central America created by Bocawina Adventure Resort. Mayflower Bocawina National Park is relatively new to the Belize national park system. Created in 2001, it is located 4.5 miles from the Southern Highway, with the turnoff near the town of Silk Grass. Silk Grass is where two of our long-time staff members are from: Apolitico Salam and Martin Ramirez each have lived there for over 20 years. The area is rich in both archaeology and in natural wonders. There are three Mayan sites located in the park, one accessible by road and the other two only a short hike away. There are numerous waterfalls in the park, but the one that we spend the most time at is called Antelope Falls. Antelope Falls is challenging to get to the top of, and steps have been built into the steep hillside to assist your effort. The trail is well worth it, as a revitalizing swim awaits you at the top. After the swim, you can take-in the breathtaking view of the Caribbean Sea from the mountainside where you stand. We spend the morning climbing up to and then rappelling down the falls. After lunch, we complete the zipline. 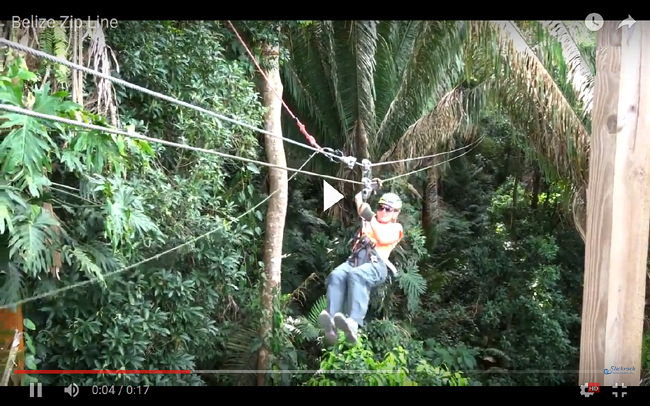 Our recent guest Rick Pratt created this short video of the Belize zip line. This video is of one of the easier sections of the zipline, but shows you that anyone can complete this exciting ride! The guides are excellent and this is a safety-conscious organization. This one day combination tour is one of the most exciting one-day activities in all of inland Belize. Out on our Belize island we have a huge fleet of paddleboards. We have 6 downwind boards, and about 15 other SUPs out there, from boards for beginners to boards specifically for surfing. And that’s a big deal, as each board is driven down from Utah, and then taken by boat 70 miles to get to the island. We always get the latest gear; we were the first to introduce sea kayaking to Belize back in the mid-80s, and that has continued all the way up to the most recent crazes: kitesurfing and Big SUPing. In addition to the gear for these sports, we have tons of other great gear: surfing, windsurfing, kayak fishing, surf kayaking, glass bottom kayaks, you name it.